No regeneration, no expensive diesel particulate filters (DPFs) to replace, no extreme exhaust temperatures and no after-treatment fluids to add. All New Holland C Series compact wheel loaders are Tier 4 Final and incorporate a proven maintenance-free solution. 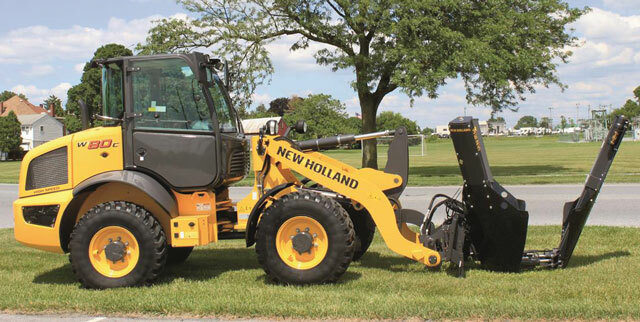 You can rely on New Holland compact wheel loaders to perform smoothly and quickly to boost your efficiency on every jobsite, says the company. A stable, compact design allows you to work and maneuver easily in restricted spaces. A lower machine height and lower center of gravity increase the stability of New Holland compact wheel loaders so you can lift and move larger loads, travel more smoothly and operate with more confidence, notes the company. The hydrostatic transmission allows for precise speed control with minimum shifting. Z-bar linkage design provides maximum breakout force and digging and lifting power for high-production load-and-carry applications. For applications where self-leveling is needed, like forklift work, consider the W50C TC tool carrier model. New Holland compact wheel loaders do more than load. With dependable engine and hydraulic power and a choice of buckets and attachments, you can easily scrape, grade, haul and more. The standard hydraulic quick-coupler is compatible with all skid steer attachments. Fast, ground-level access to maintenance points and long service intervals reduce the time your operators spend on routine maintenance tasks. All C Series loaders are equipped with a ROPS/FOPS certified cab that incorporates big comfort, with roomy dimensions and ergonomic controls. Redesigned wide steps give you easier cab entry and exit. The seat, steering column and armrest adjust to make every operator comfortable. The standard LCD display puts information within an easy glance. The high-performance heater/defroster is standard, with optional air conditioning for comfort in any season. The cab is fully sealed and pressurized to keep out noise, dust and fumes and offers an optional radio. Providing the operator with a safe, comfortable cab allows them to confidently do their work and be productive longer. Check out more 2017 utility vehicle specs here.